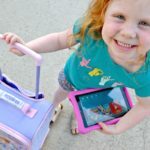 Anyone else feel like your kids are growing up at triple the speed you did? I feel like my daughter, now five, just catapulted herself through the last five years and I end up reeling with the knowledge that she starts kindergarten later this year. 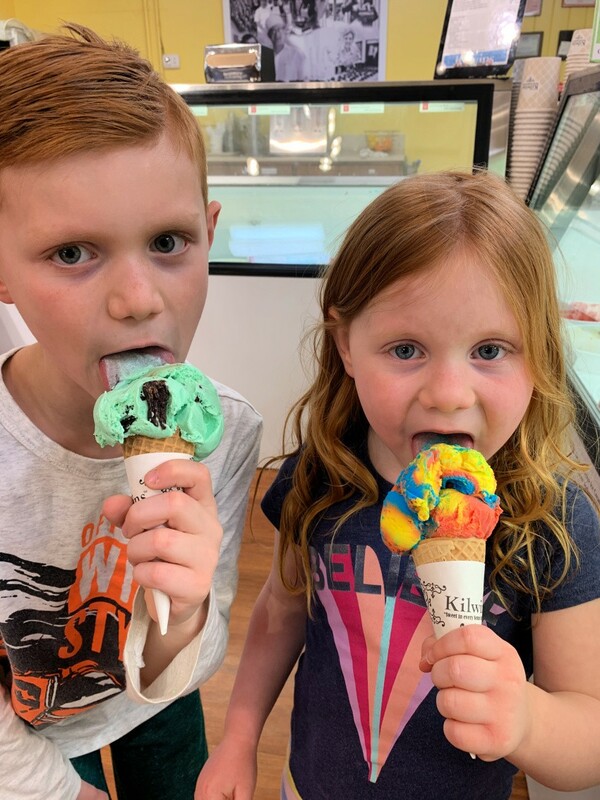 Because time seems to be flying by at a rapid pace, now more than ever, I am prioritizing taking trips with my family because I know it’s only a matter of time before my kids will be older and not wanting to hang out with us as much. 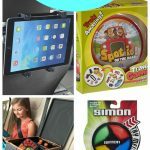 We’ve cut back on the “things” we get our kids and we focus on the things we can DO with our kids. 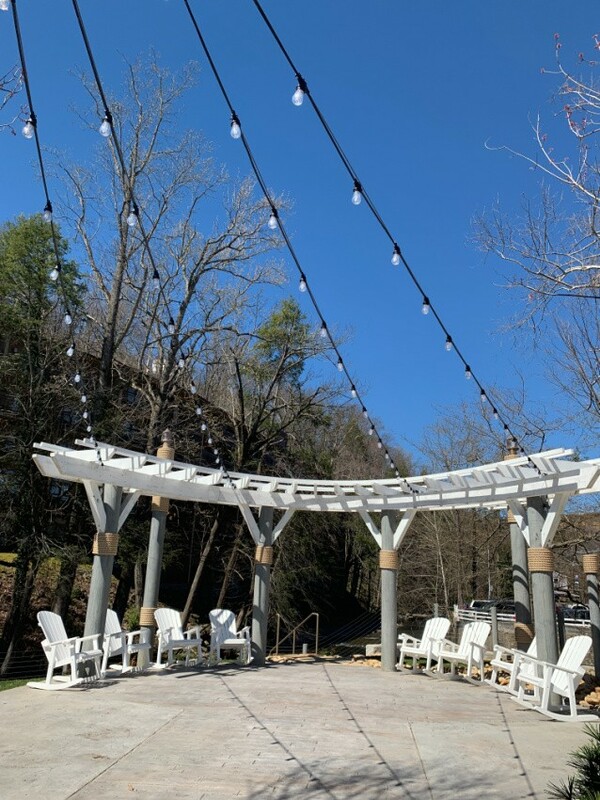 And today I want to walk you through our 4 night, five day Spring Break vacation to Gatlinburg, Tennessee and things to do in Gatlinburg, as well as where to stay in Gatlinburg, where to eat in Gatlinburg, and why you should visit Gatlinburg in the first place! I’ll be your Gatllinburg, TN Travel Guide for the next few minutes as you read through this, so leave a comment if you have any questions! 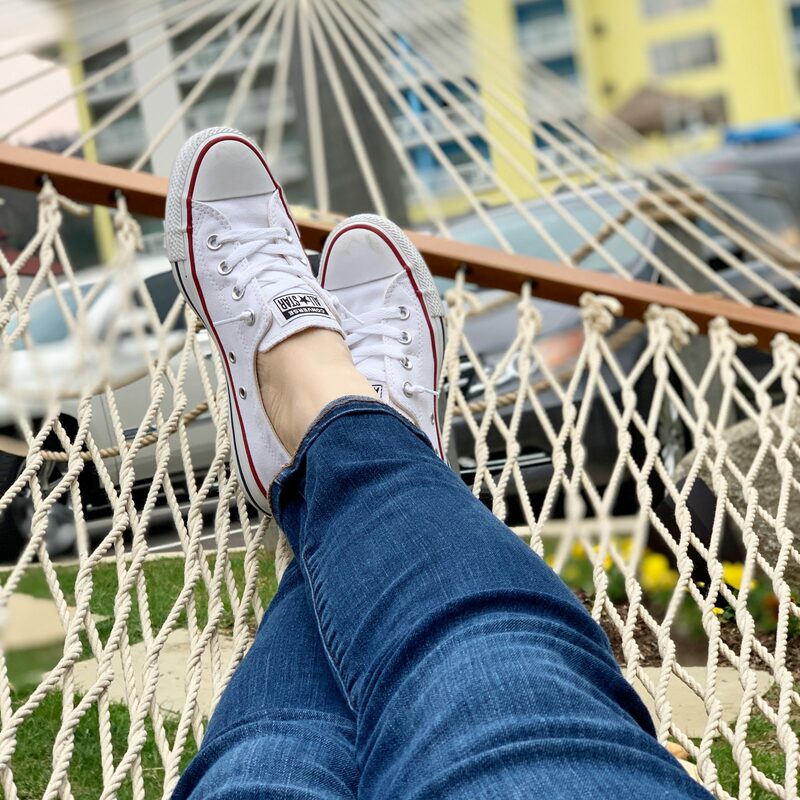 Gatlinburg, TN is only about 6.5 hours from Central Ohio, where I live, so it makes for the perfect Spring Break vacation destination for Ohioans. 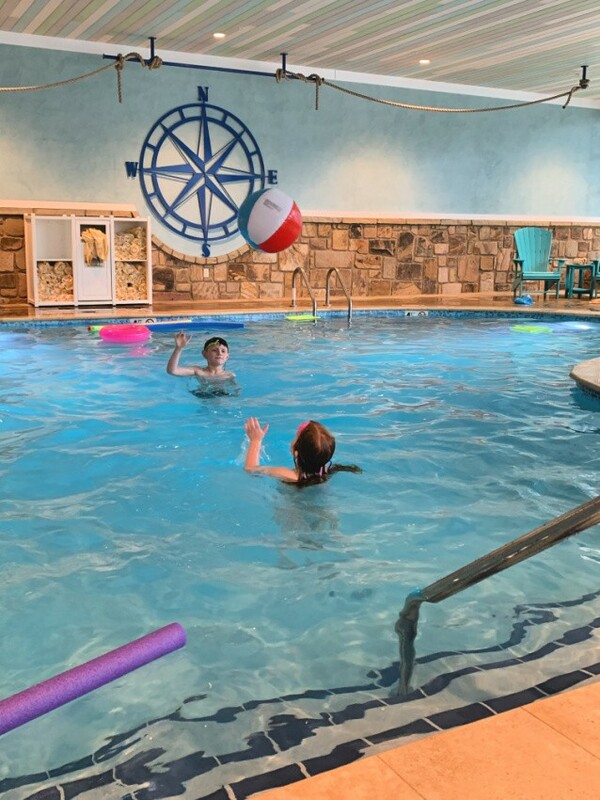 Matter of fact, while we were there, my son ran into a classmate from his school and they said they’d run into three other families from the same school while there already–so it’s a popular vacation destination! I used to go to Gatlinburg as a child and many of the shops and places I used to visit with my family are still there to this day! 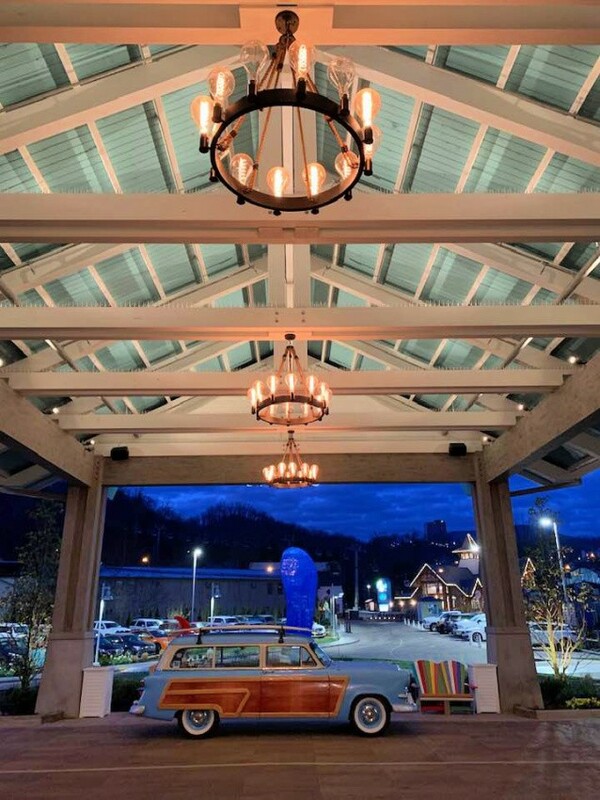 There’s tons of options for places to stay in Gatlinburg, TN, so it’s easy to get overwhelmed quickly. 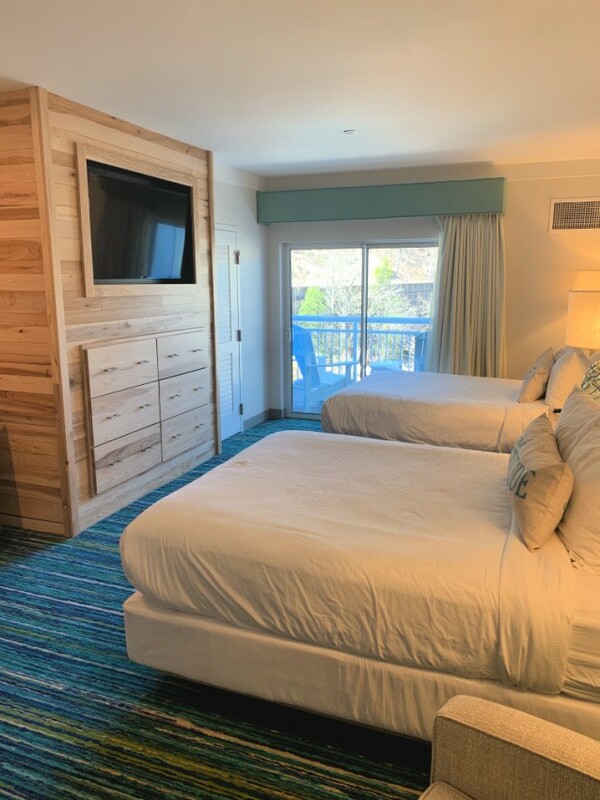 I’ve stayed in Gatlinburg cabins, as well as Gatlinburg hotels and I’ll tell you that each have their own benefits depending on what you’re looking for. 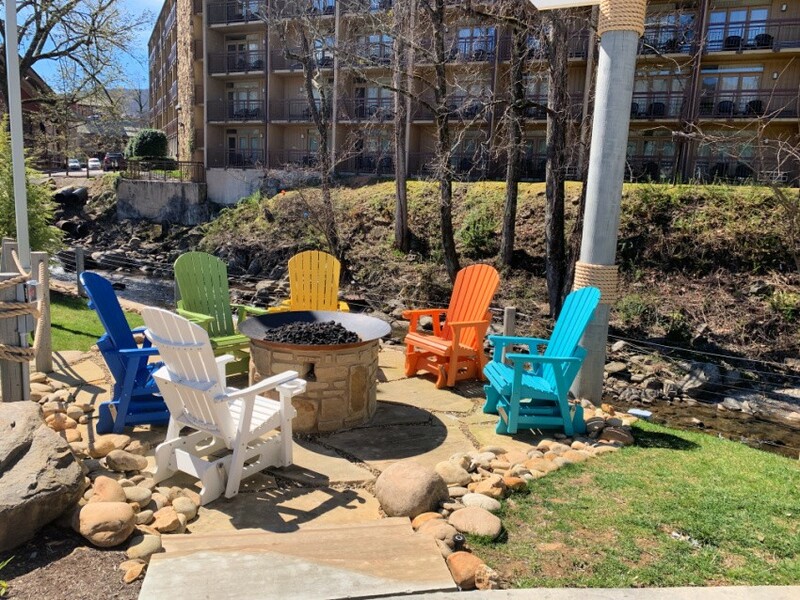 For this trip, we stayed at hands down, the nicest hotel in Gatlinburg, Margaritaville Resort Gatlinburg, for our stay and it was perfect for our trip. 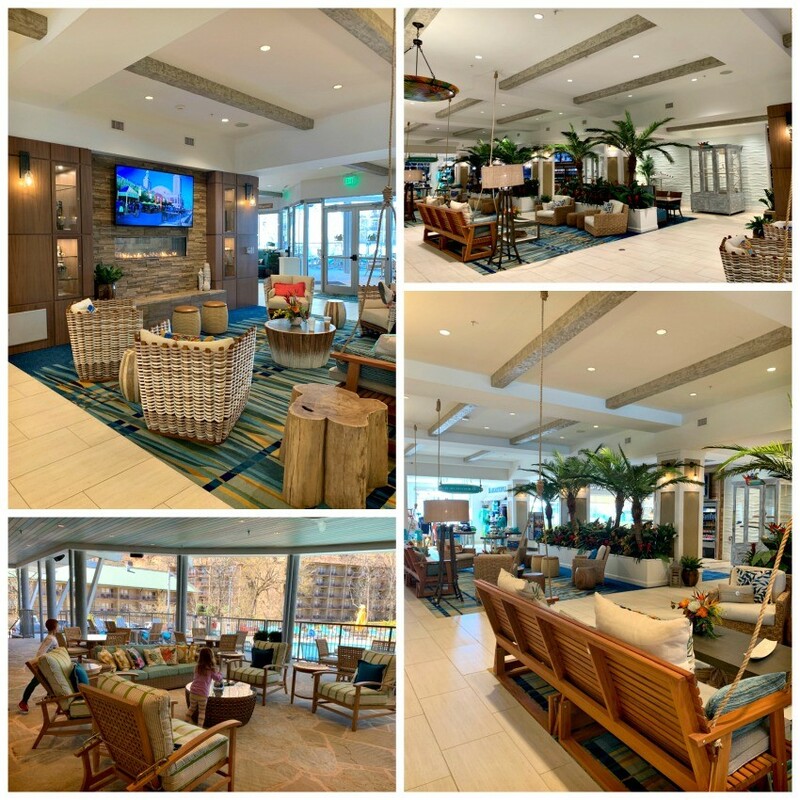 Margaritaville Resort opened in July 2018 and is STUNNING. 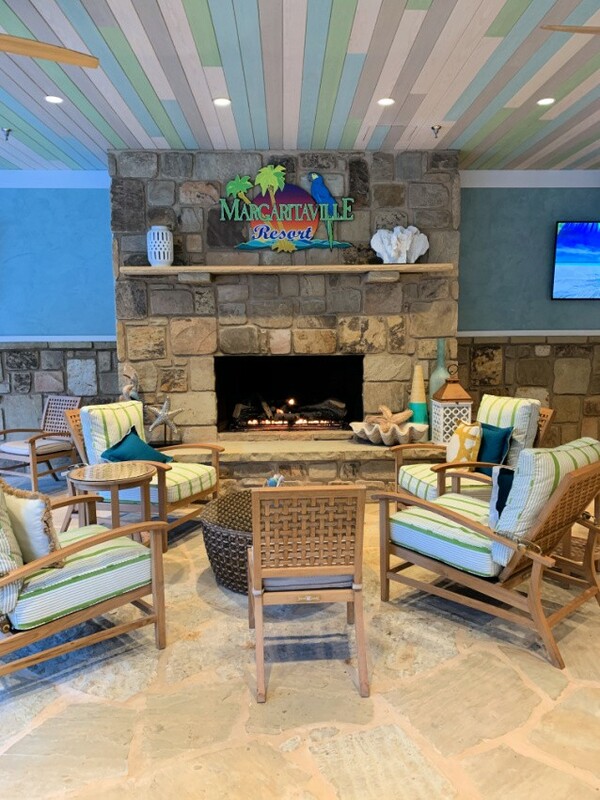 Margaritaville is beautifully decorated with a large, welcoming foyer with loads of room to sit, including a bar with the BEST drinks, live music nightly, and an outdoor seating area around several fire places and fire pits, which really gives you the ability to sit back and relax after a busy day in Gatlinburg. 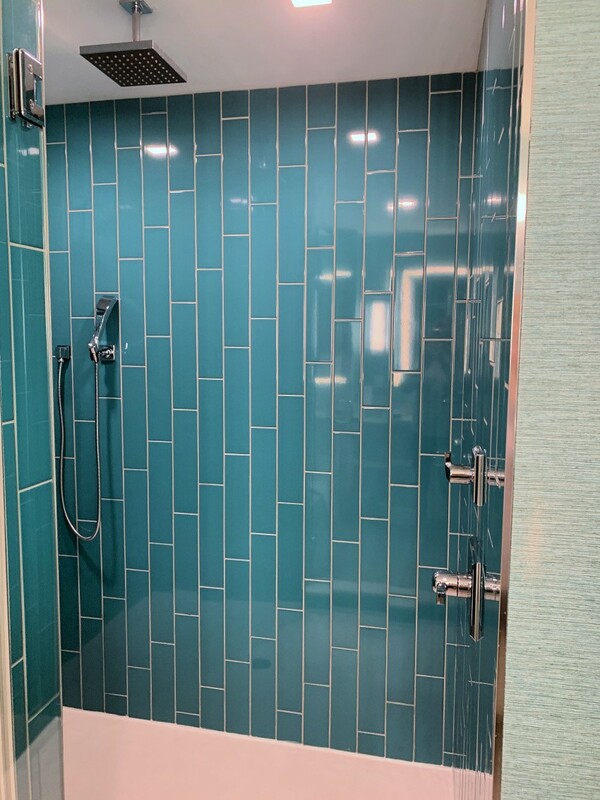 They also have in room dining, a coffee shop on site, as well as a gorgeous spa if you want to go all out on the rest and relaxation! 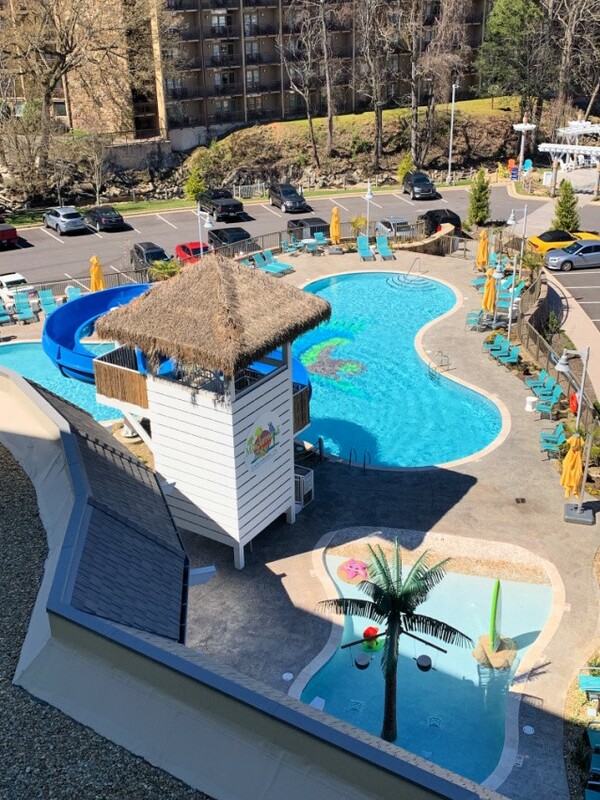 Margaritaville it is located in a prime location right in the heart of Gatlinburg, they offer both indoor and outdoor pools (outdoor is heated too! ), a hot tub, food and drinks on site (the best margaritas, obviously! 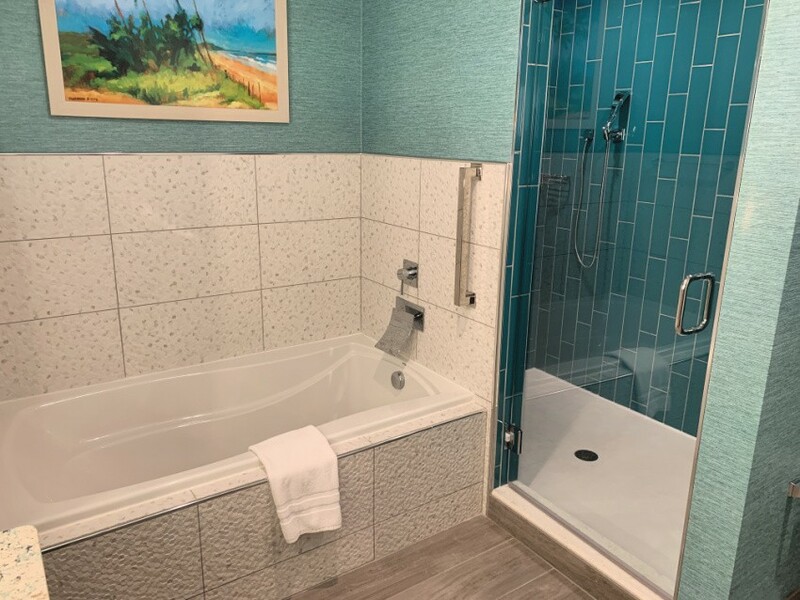 ), all the rooms have beautiful views of Gatlinburg, and they are SO clean and the service is outstanding. 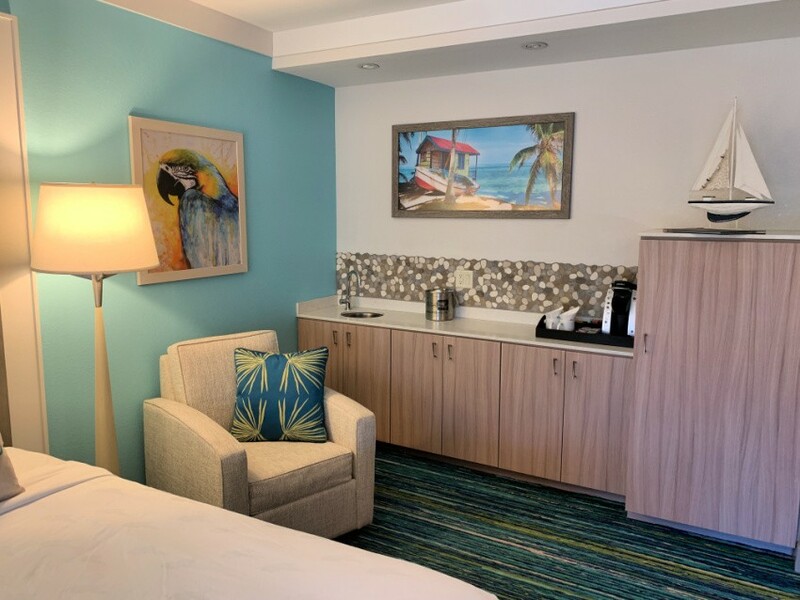 You really can go to Margaritaville and just enjoy time at the resort for a long weekend because everything you need is on site–good food, good drinks, and plenty of places around the grounds, pool, and spa to relax! 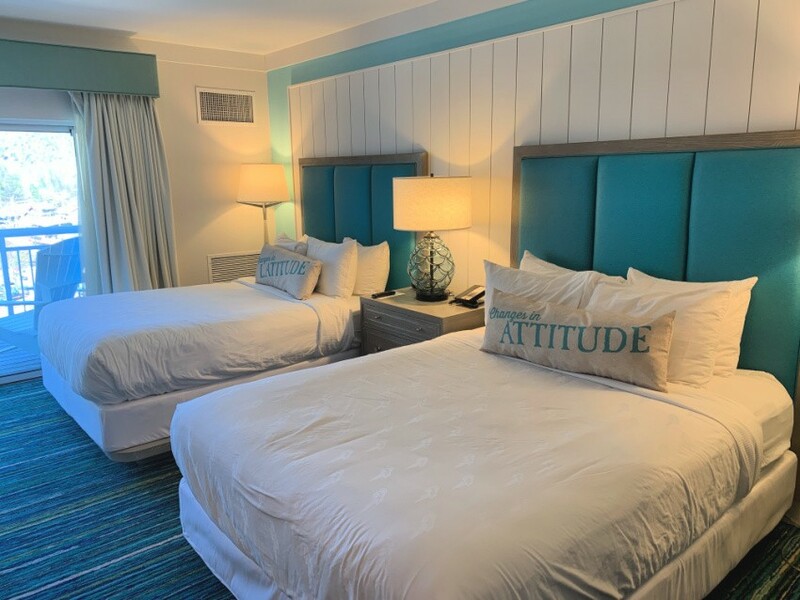 We THOROUGHLY enjoyed our stay at Margaritaville and look forward to visiting other Margaritaville Resorts in the future for our vacations. Want to try Margaritaville for yourself?! My readers can get 10% off their stay by using code “ADGB” when they book online! 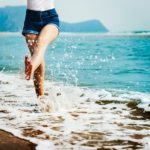 My husband and I could have gone out on the town and had some fun to ourselves, but we had no one to watch our kids, so that wasn’t in the cards this time. Gatlinburg has lots of places for adults to enjoy, as well as kids, but while you’re there you definitely need to try some Moonshine! Gatlinburg has tons of options for moonshine tasting, but we hit up Ole Smoky Tennessee Moonshine and had some fun tasting the different options. I ended up going home with a jar of Blackberry Moonshine that is PERFECT with lemonade on a warm day!! 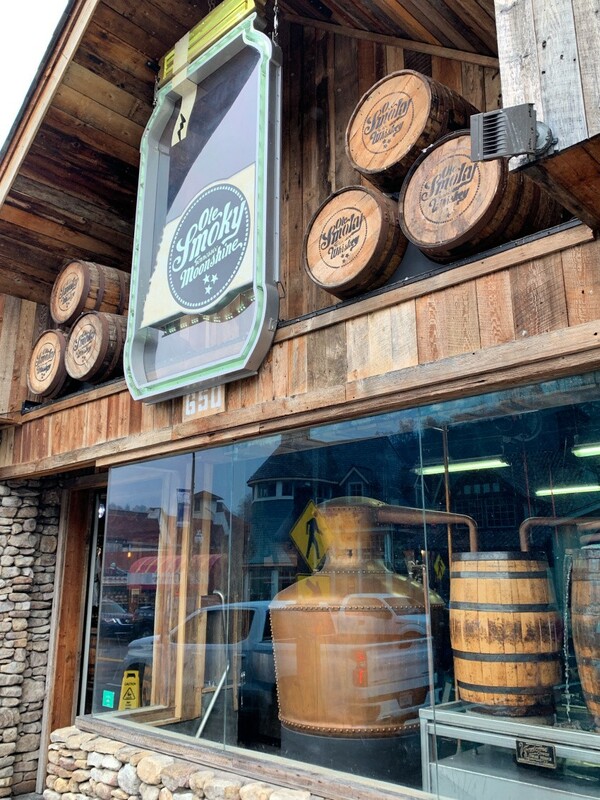 Ole Smoky is located on the main strip in Gatlinburg and we were able to pop in for a quick tasting with our kids in tow and be out in about 15-20 minutes. 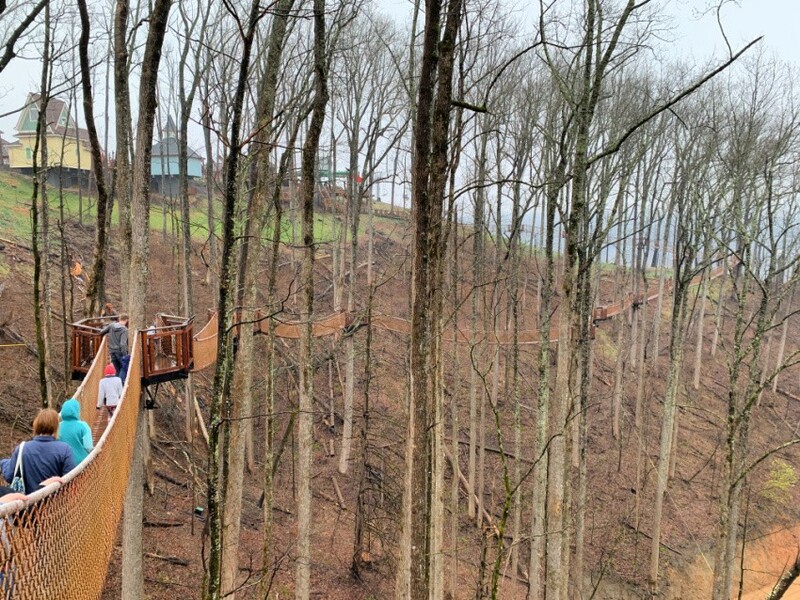 It’s a super fun way to try some adult options in Gatlinburg. Obviously, there are two main free things to do in Gatlinburg. 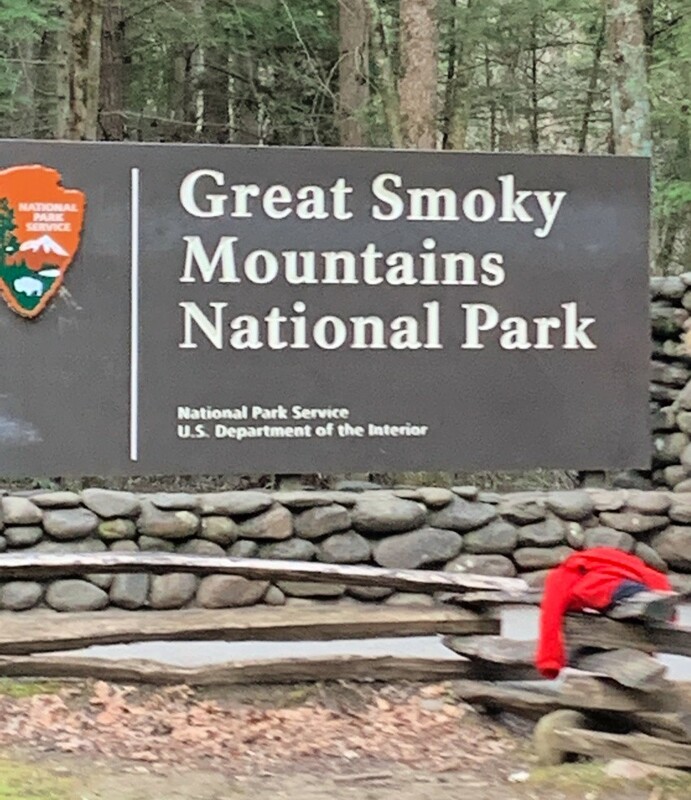 First is to enjoy the Smoky Mountain National Park system (that goes without saying), which is great because it’s completely free for guests to visit (unlike some of the other national parks in the country). You’ll definitely want to pay attention to Gatlinburg, TN weather and seasons to gauge how much you’ll be able to hike when you visit. 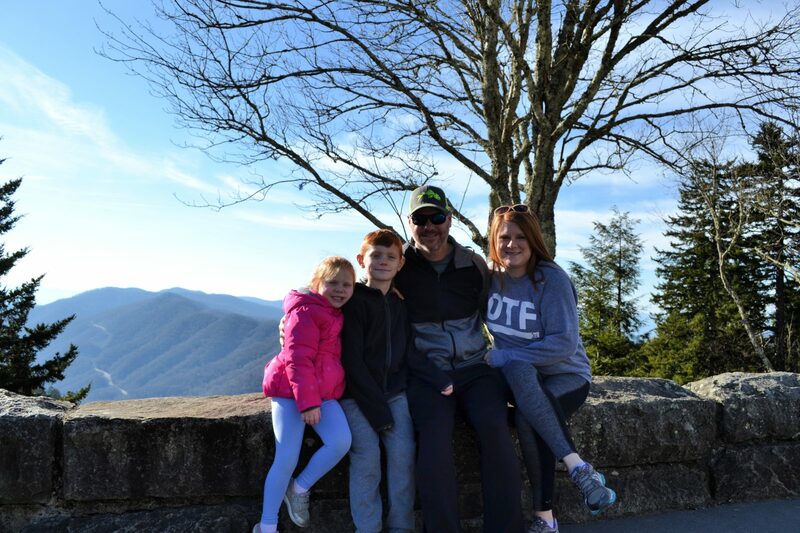 For example, we went the week of spring break and some of the hikes we’ve enjoyed in the past like Andrew’s Bald and Clingman’s Dome were closed still for the winter. So be sure to scope out what your goals are for hiking when you plan your trip. 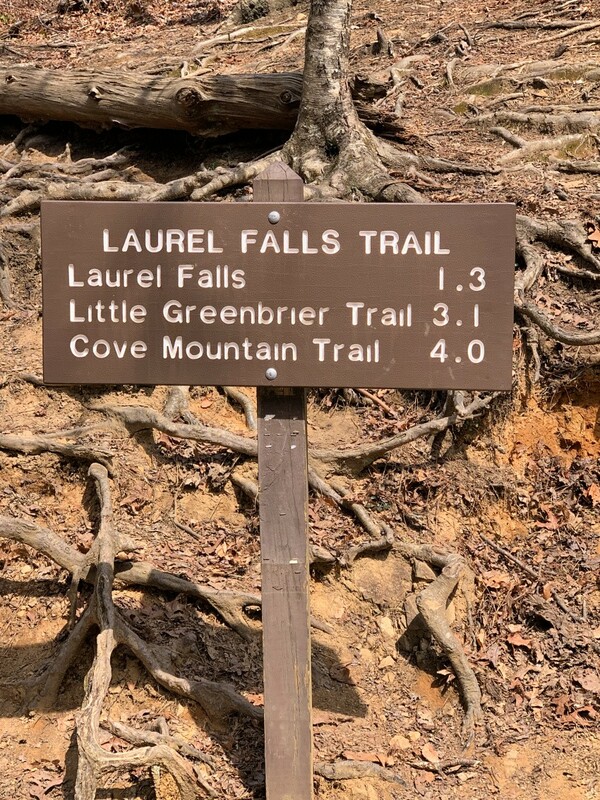 Our daughter was still kind of too young to really do long hikes, so we went on one hike while we visited and hiked the Laurel Falls hike, which is 1.25 miles each way. The hike wasn’t difficult, it’s paved (mostly) and it has a beautiful view of a great waterfall at the top of the hike. The only suggestion that I would make is that you time it well because it’s the most popular family hike in the park and hundreds of people were hiking it when we were there. The parking for this hike was very difficult too, so be sure to get there early! 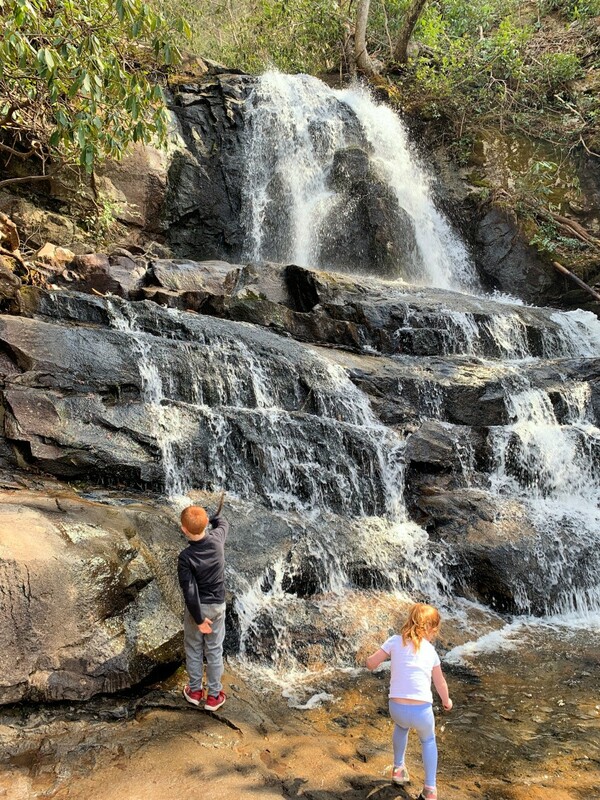 The other drive we did was to Newfound Gap to take in the views since Clingman’s Dome was closed when we visited (super bummer–but if you’re visiting when it’s open, it’s worth going up to!). The other “free” thing we did in Gatlinburg was to walk around all the shops. I can remember visiting them as a kid and watching people make candy at the candy stores. They have more “strip mall” type shops on Parkway, but they have a cute little shopping area tucked back on Parkway called “Village Shoppes” that have lots of really neat little stores with higher end items. We spent a few hours just walking around there and shopping. 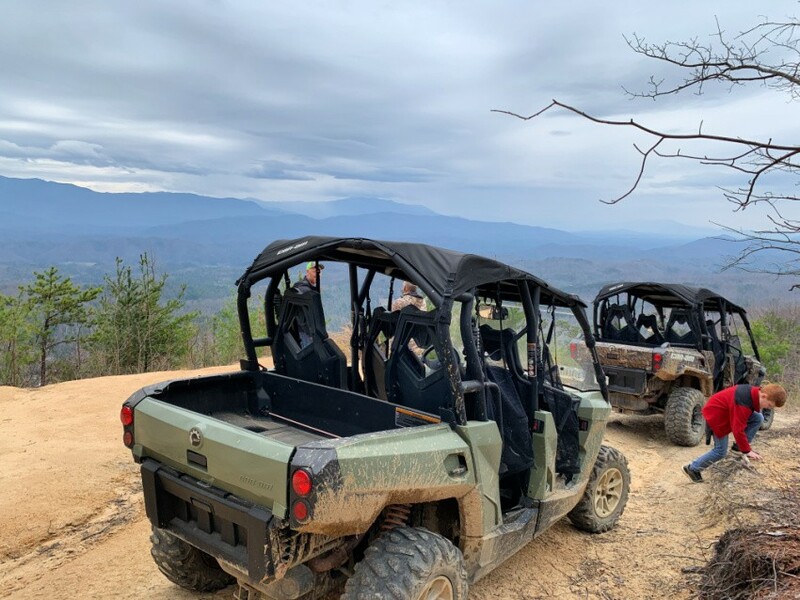 One of the BEST things we did in Gatlinburg was an amazing UTV tour we did with Smoky Mountain Adventure Tours. I came across them on Facebook a few months before we went and reached out to them. 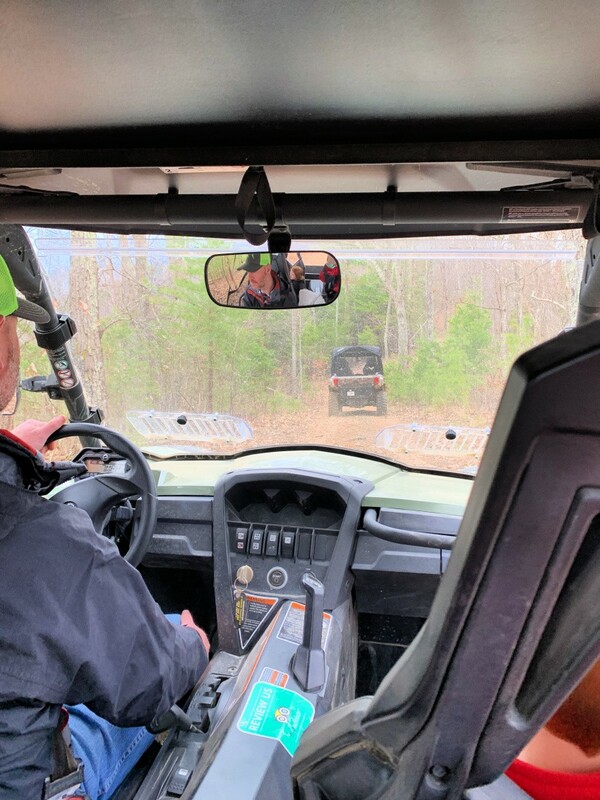 They took my family on the ride of our lives with an amazing UTV tour. 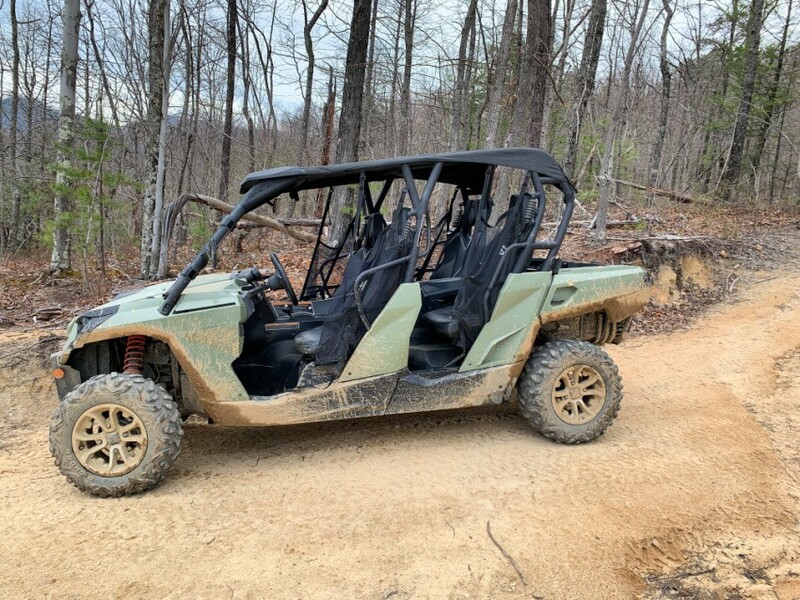 This was my husband’s FAVORITE part of the week…we went out on a tour led by a guide, deep within the woods of the Smoky Mountains. The tour lasts about 2-2.5 hours and is thrilling, beautiful, and so fun for all ages. 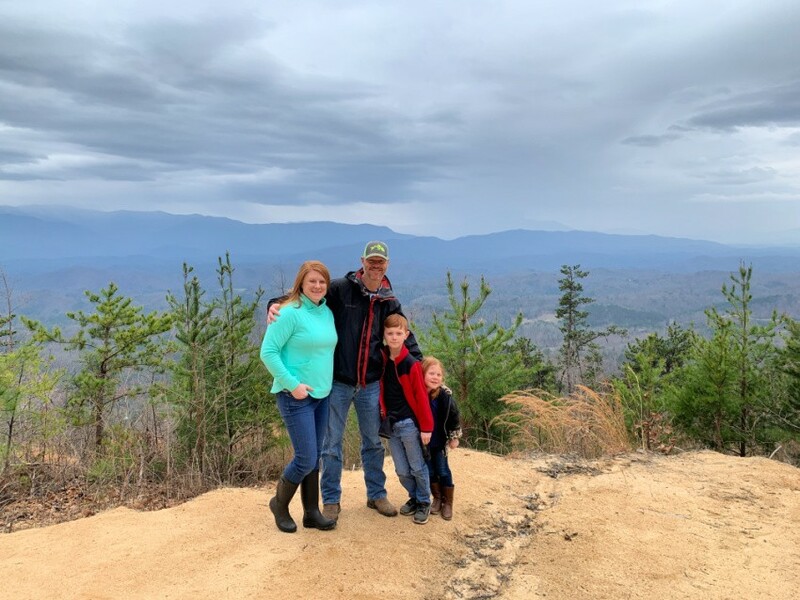 My kids, 5 and 9, loved going down the steep hills, the muddy puddles, and I loved the view we had of the Smoky Mountains once we reached the top. It was SO much fun and definitely a highlight of our trip!! If you want to do something different and exciting, this is your GO TO tour! Check out our video from when we were out…I drop a “sh*t” in the video, so please excuse my cursing (I’m kind of a baby when it comes to adventurous stuff LOL). 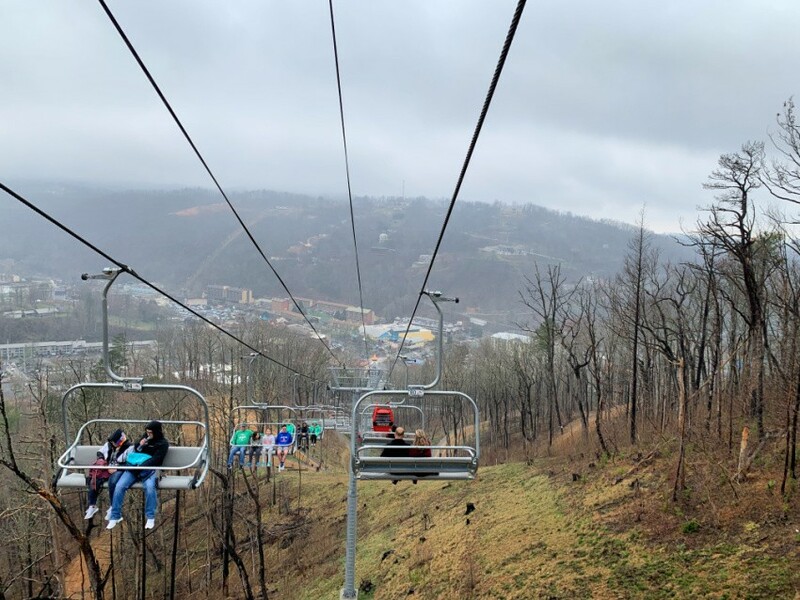 Familiar with the Gatlinburg skylifts? 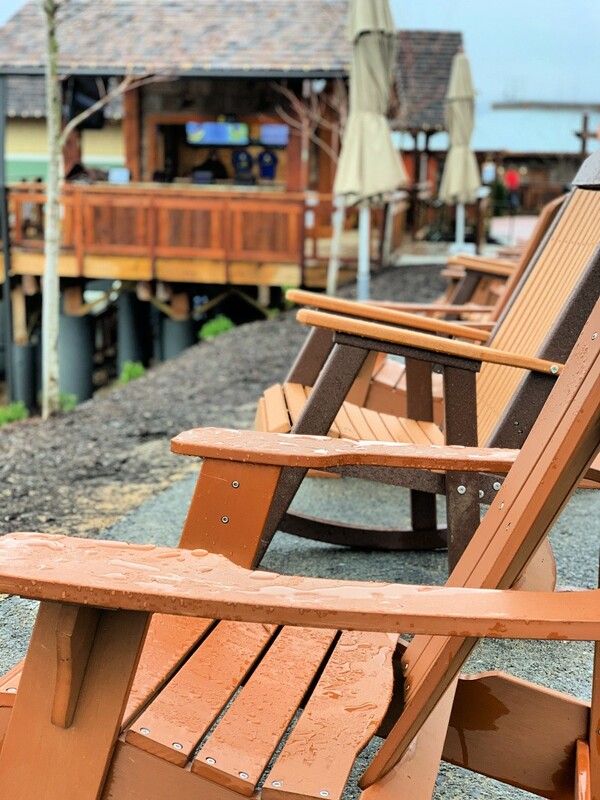 Thrilling chair rides that take you to the top of the mountains in downtown Gatlinburg? Well, Anakeesta is the newest to scene, just opening recently, which provides a skylift ride to the top of the mountain where you can enjoy breathtaking views of the city, an beautiful and exciting tree canopy walk way above the ground, opportunities to zipline and ride the mountain coaster (for an extra fee), as well as play, shop, dine and more! We were lucky enough to get a first hand tour from one of the owners throughout the park and check out all that Anakeesta has to offer! 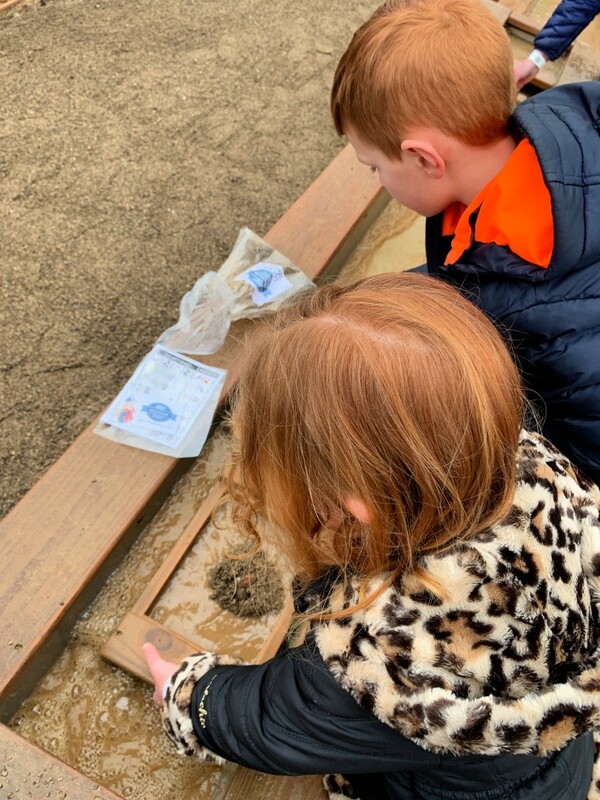 My kids loved shopping for souvenirs in Firefly Village, playing in the super cute Treehouse Canopy Playground, and their favorite was gem mining and finding all the gorgeous stones! 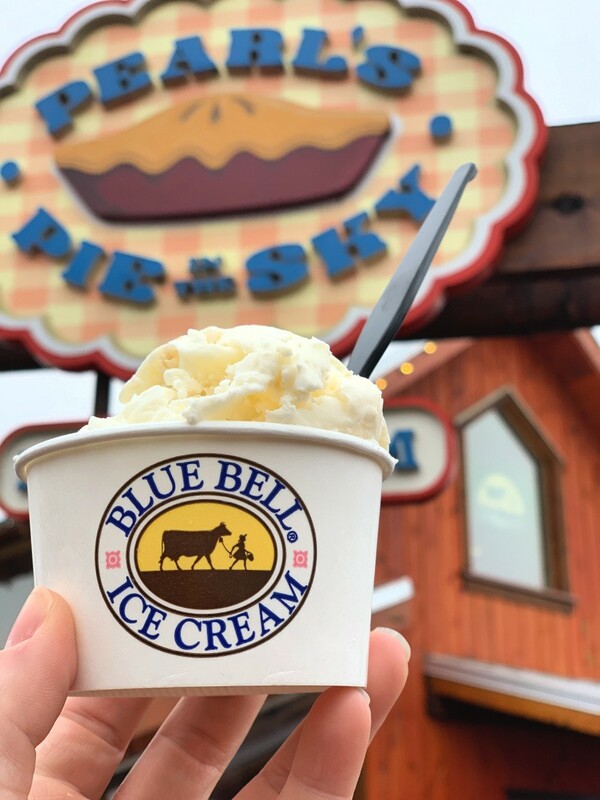 We enjoyed the one and only Bluebell ice cream while we were there (our favorite ice cream that you cannot get in Ohio), but they also have other places to eat if you just want regular food with great views! Sadly, when we visited it was rainy, so the “smoky” part of the Smoky Mountains were in full effect, so we missed the best views. 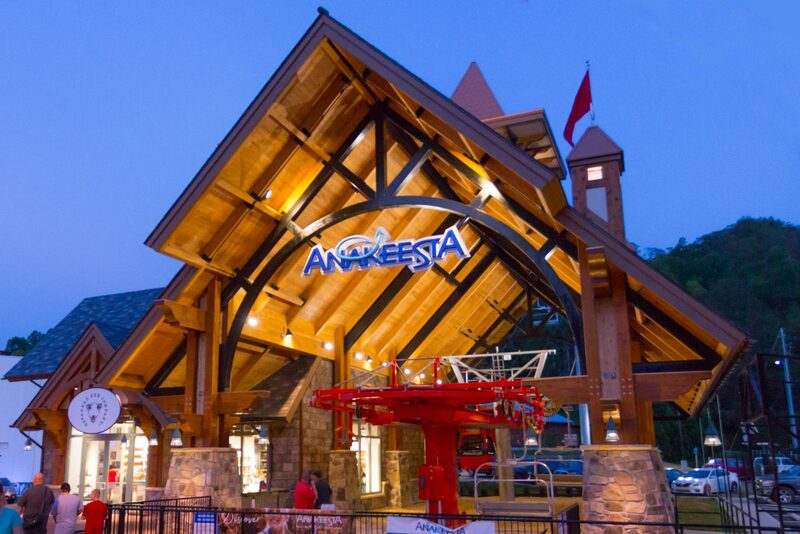 I also love that Anakeesta is continuing to expand…they told us so much more about all the plans they have for this little Gatlinburg oasis in the next few years, which sounds super exciting! The other thing that I really loved about Anakeesta was that they gave an ode to the people who were effected by the Gatlinburg fires in 2016 with plaques explaining what happened on how the community came together to support one another, which was really educational and touching. The other cool thing–Blake Shelton and Gwen Stefani just recently visited Anakeesta with their families…so ya know…if they came for a visit, then it must be good!! Definitely take the time to head over and check out Anakeesta. 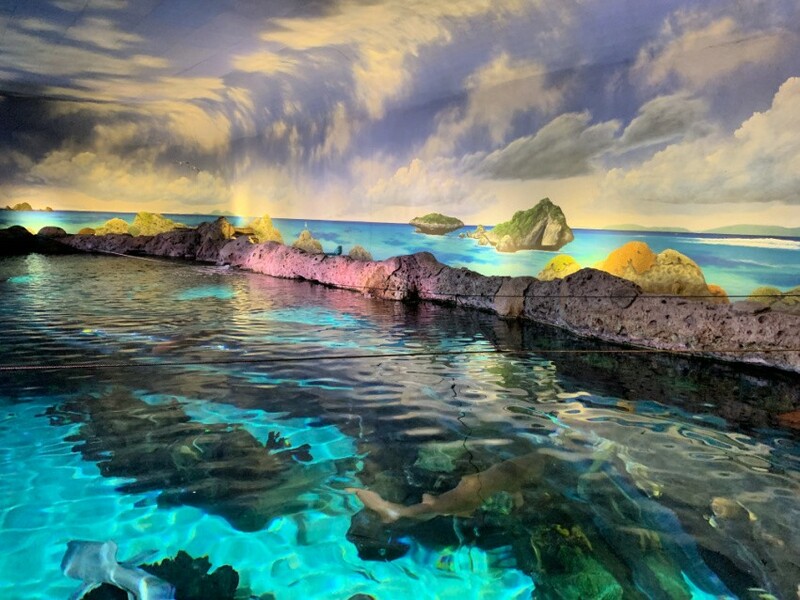 Right next to our hotel, Margaritaville Resort, is where the Ripley’s Aquarium is located. 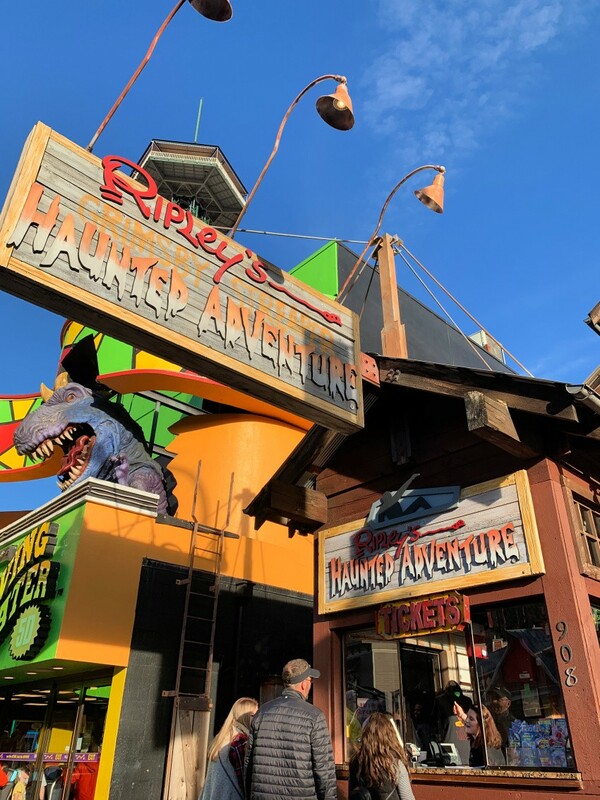 Ripley’s has a whole list of eight different attractions in Gatlinburg and you can visit all of them if you buy the combo passes. 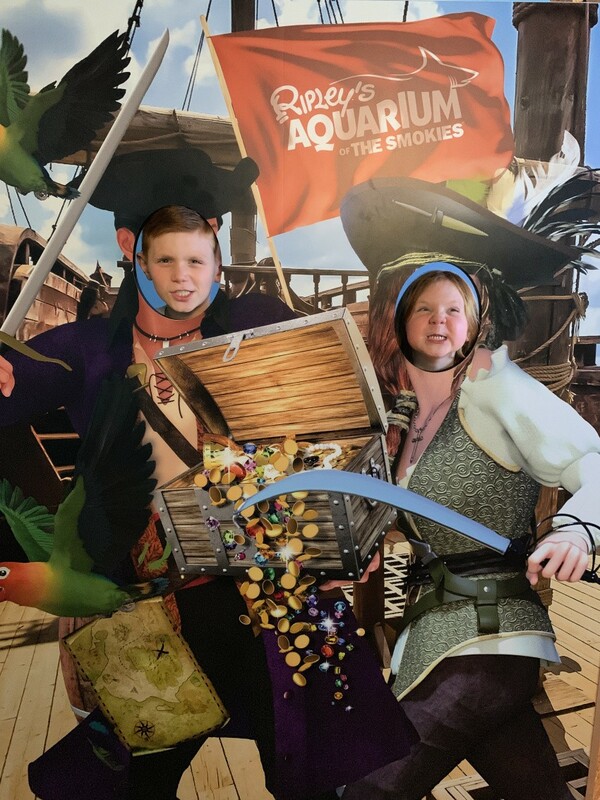 We enjoyed going to the Aquarium, the Mirror Maze, and the Haunted House the most…my son and husband went through the Haunted House three times while were were there!! 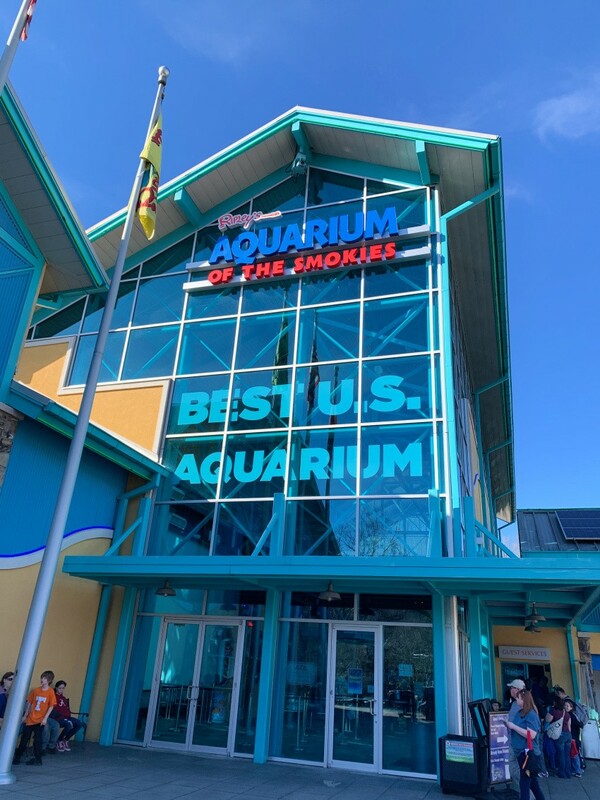 The Ripley’s Aquarium in Gatlinburg was so much fun and I loved that it mixed the educational piece of all the sea life, as well as the play area piece that my kids crave. We played at the aquarium for quite some time and the kids really enjoyed it!! 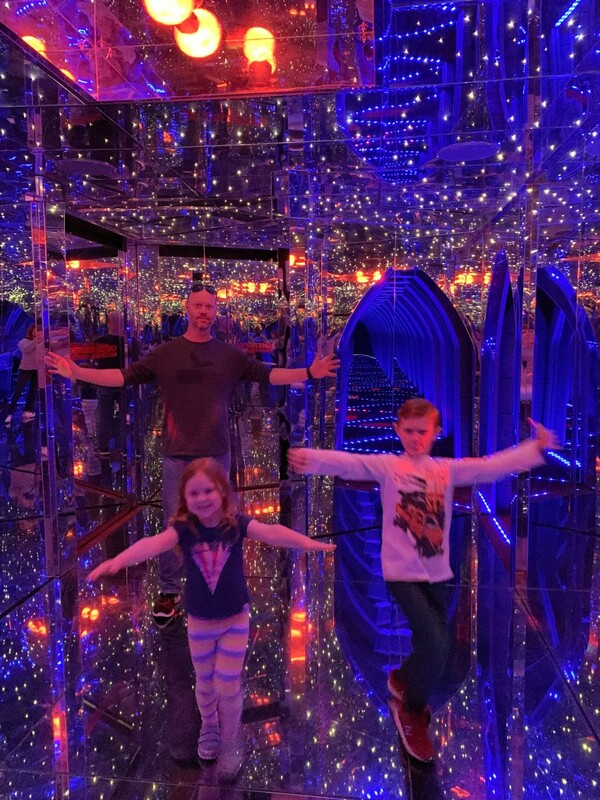 The Mirror Maze is a quick, but fun walk through a house of mirrors…we went through it three times. 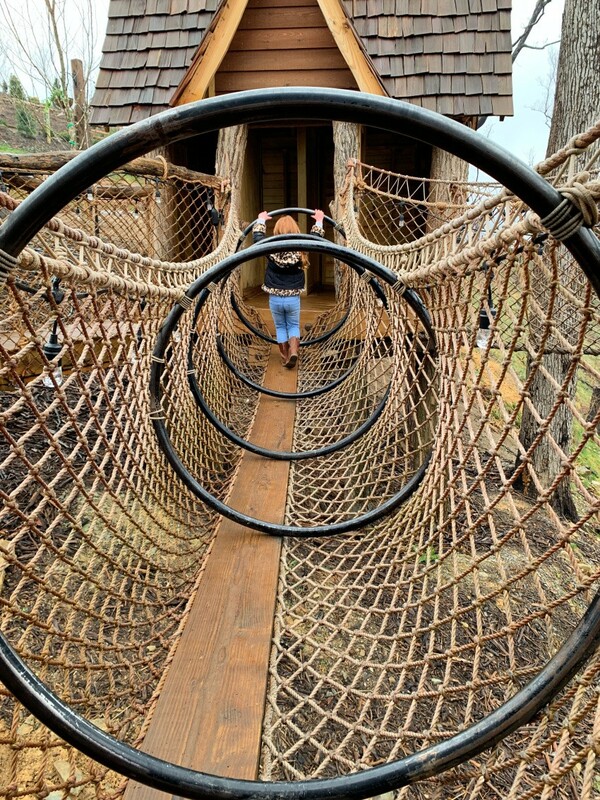 My daughter, 5, got so excited at one point that she forgot she had to walk and she crashed head first into a mirror and gave herself a huge bruise, but we had a great time playing in the maze. My husband and son enjoyed the Ripley’s Haunted Adventure the best. I didn’t go because my daughter was too young, but I hear it was super fun if you like Haunted Houses! 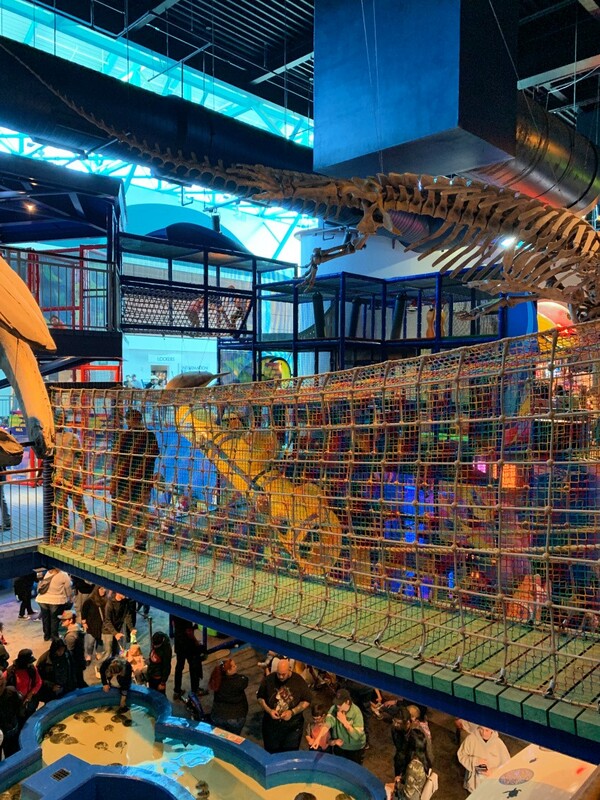 And there are loads of other Ripley’s attractions to hit up while you’re there too, if you want some fun and unique things to do! 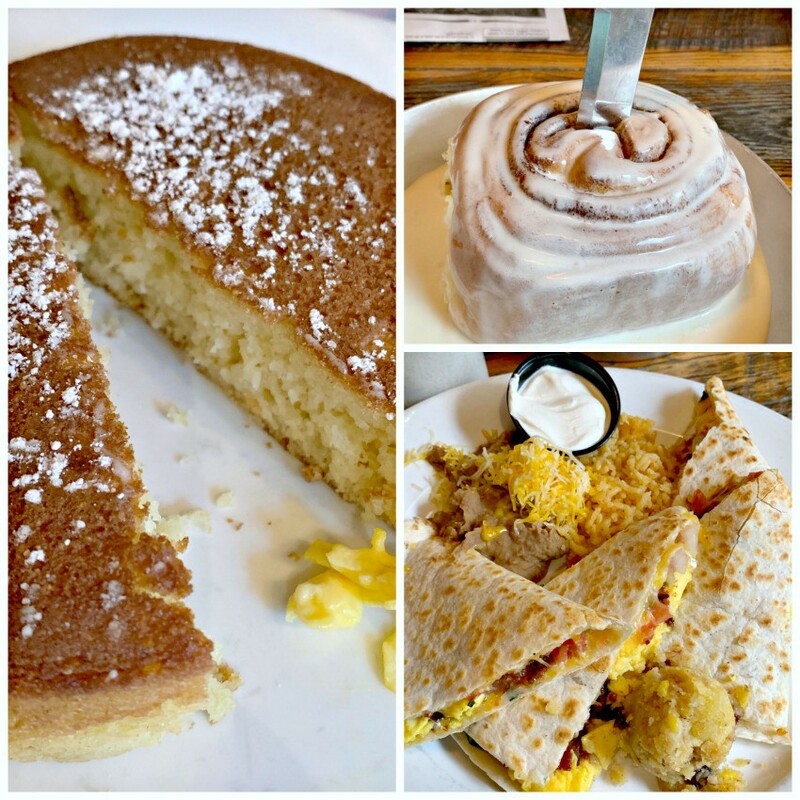 The iconic Crockett’s Breakfast Camp did not disappoint. Although we were met with a less than friendly waiter, they had delicious and unique food that we really enjoyed. We’d go back again, but hopefully get service from someone a little nicer. 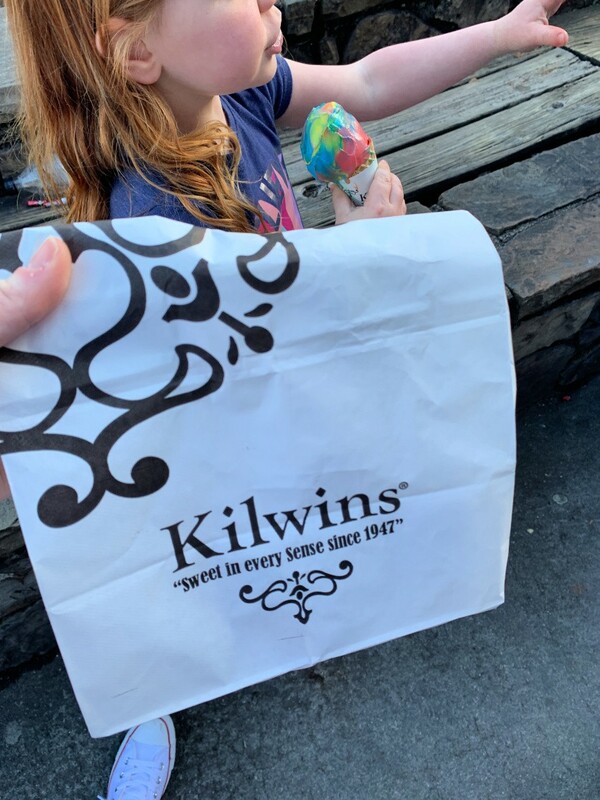 DEFINITELY a must eat while in Gatlinburg! Margaritaville’s own coffee shop had the BEST smoothes, coffee, baked goods, and warm breakfast items! If you want something quick and easy that’s way better than your local Starbucks, this is your go to stop! The smoothies are life changing! 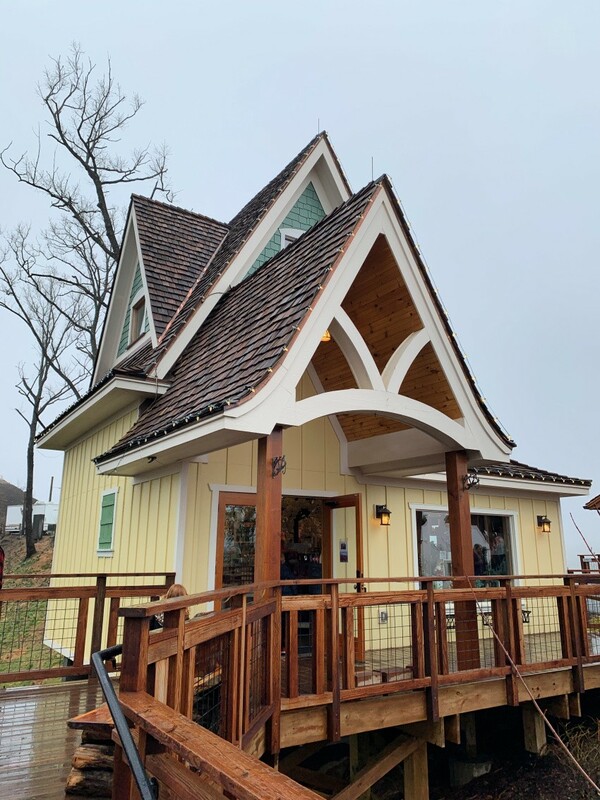 The Donut Friar, which is tucked away in The Village Shops in downtown Gatlinburg, is an affordable treat worthy of your visit. This small donut shop has been faithfully serving tourists and locals since 1969 and has a loyal following. Since the staff starts making donuts from scratch long before the 5:00 AM daily opening, don’t be surprised if a strong aroma supernaturally pulls you into this tiny shop. The wide variety of donuts, which range from $0.97 to $1.14 each, are made on-site each morning. Beware that the shop gets busy fast, so get there early!! 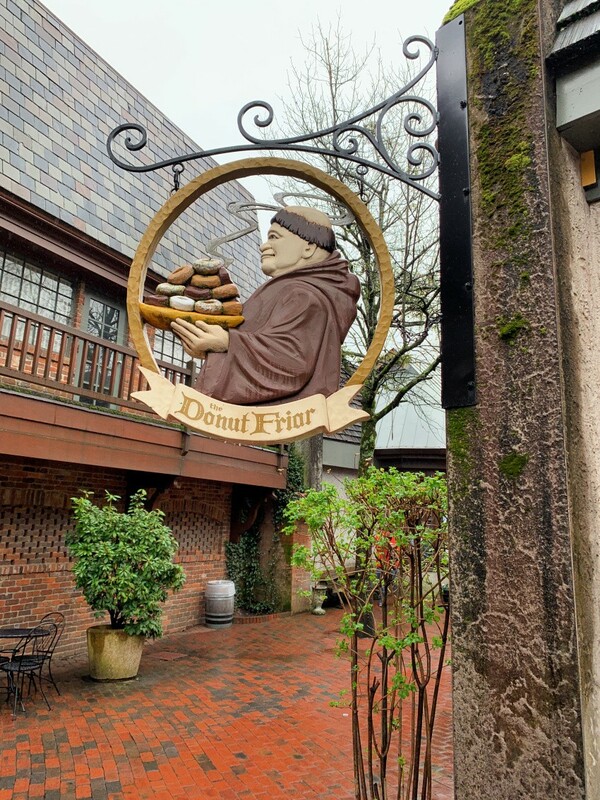 *The Donut Friar is CASH ONLY…so be sure to have plenty of cash on hand! Sadly, we did not get a chance to eat here, but every time we walked by there was a huge line out the door and the reviews were great, so make the time to get up early and check out the Pancake Pantry. Let me know how it is! We lunched at Calhoun’s in Gatlinburg, which is a great location for delicious smoked brisket, pulled pork, and more. You’ll enjoy this authentic BBQ in a great location with lots of shops nearby and a great atmosphere. Smoky Mountain Brewing Company is right behind it, as well, which may be another good option for your family. The Landshark Bar and Grill, just outside of Margaritaville Resort, was also a good and nearby option for dining nearby. **My family got tired of eating out so much that we finally just bought some lunch meat and PB&J supplies and had fruit, sandwiches, and pretzels in the hotel room some days. It was a nice option for a quick and inexpensive meal vs. eating out three times a day! The Best Italian Restaurant was one of our favorite places in Gatlinburg for dinner. 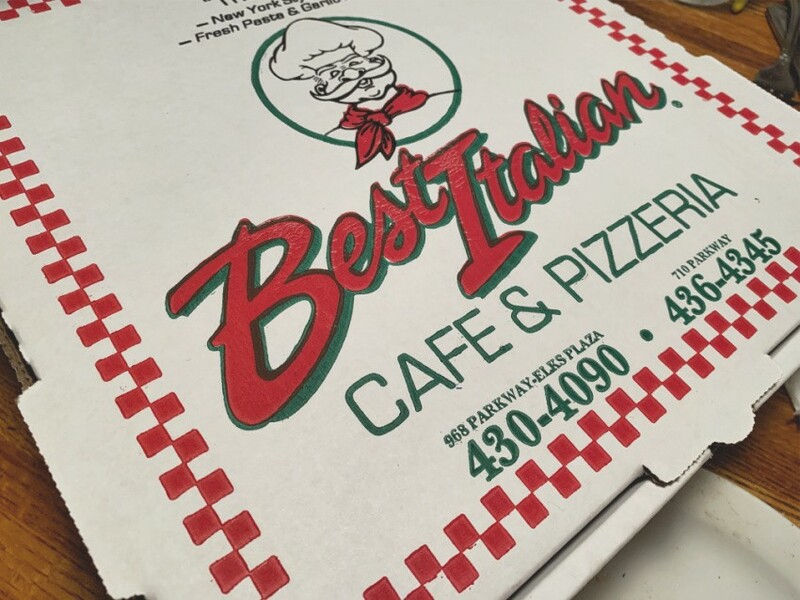 The pizza was delicious, they had great spaghetti (my son’s favorite), and the BEST service in Gatlinburg! Plus, you have enough pizza for lunch the next day too!! 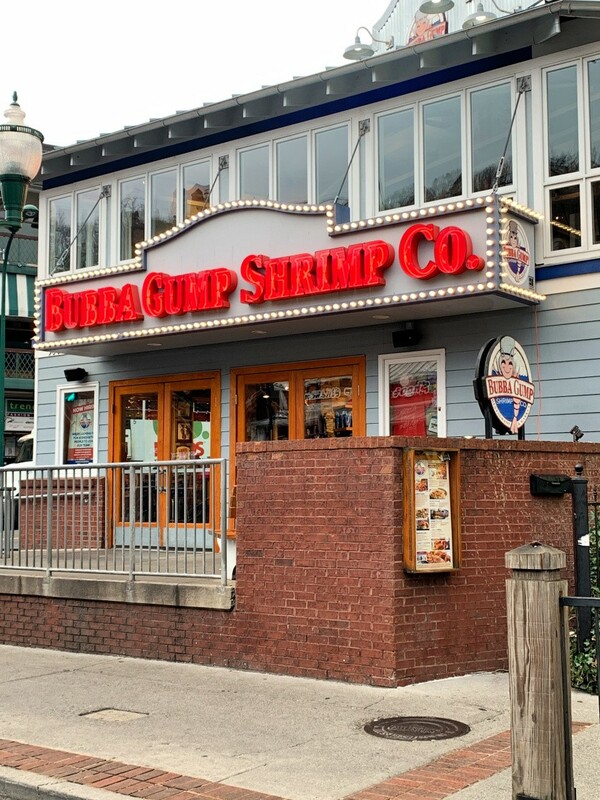 We also enjoyed dinner one night at Bubba Gump’s, which my parents recommended to us when they went a few years back. It has a really cool environment and is fun for families to visit. Definitely worth stopping by and enjoying! 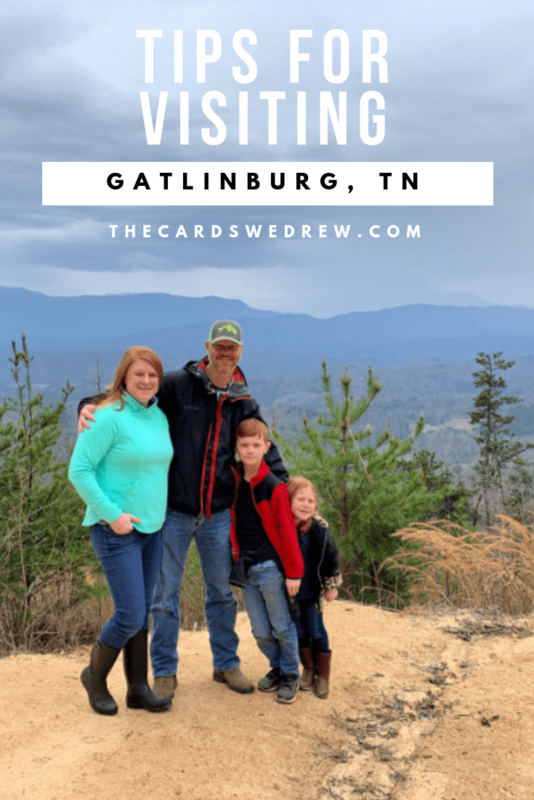 We had SUCH a nice time visiting Gatlinburg for Spring Break…it was just as much fun as I remembered as a kid and we want to go back again when our youngest is a little older so we can hike more. 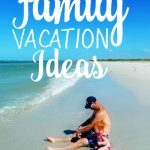 If you have anything to add to this list, please leave it in the comments below to help other families and travelers like mine make the best out of their Gatlinburg Vacation! 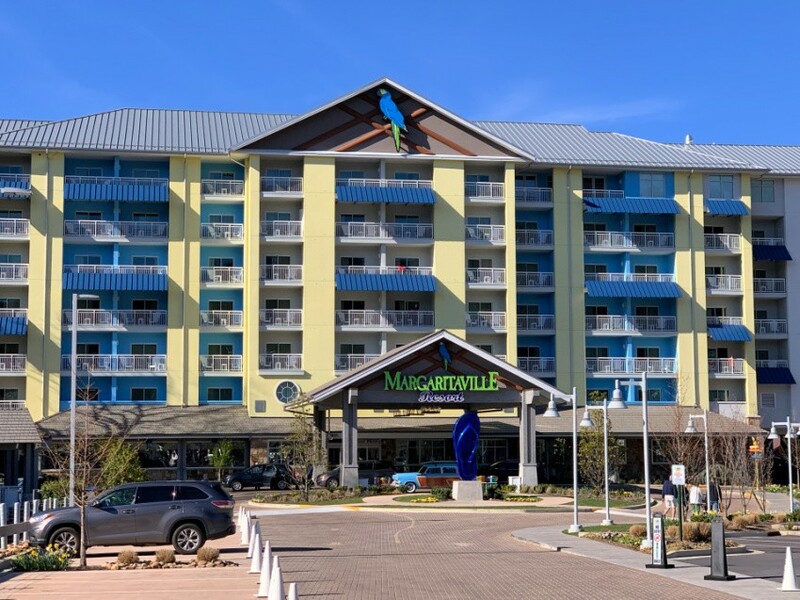 *Thanks to Margaritaville Resort for hosting my family. Thanks to Anakeesta, Smoky Mountain Adventure Tours, and Ripley’s for providing us with free passes to visit! All thoughts, words, and opinions in this review are my very own.